A third of the way through this bowl of Rich Dark Flake in a 1984 black sandblasted straight Dunhill Shell 4103 Billiard with a black vulcanite stem. This will finish the sample. Just finished a nice big bowl of Black Frigate in my Brebbia Lido; An excellent nightcap. I couldn't help but notice that your profile pic resembles the man on the label for Edward G. Robinson(presumably Edward G. Robinson himself). If so, is that a particular favourite blend of yours? Not far from finishing this bowl of D&R Two Timer Gold in a smooth full bend 1977 Crown Coachman 215 egg with a black vulcanite stem. Last smoke of the day is Angler's Dream in a slight bend 1984 Stanwell Antique 124 grain etched with a smooth front with a black vulcanite stem. Watching the documentary Rock 'n Roll Inventions. GLP Stonehenge in my Jobey Dansk Freehand that I purchased in the 1980's. Couldn't sleep, and I hate to waste time, so I'm smoking Old Colonial in a medium bend beater 1979 Aalborg natural freehand made by Nording with a black vulcanite stem. Watching Wanted: Dead or Alive. Just finished smoking Jim's Va/Bur in a 2015 Basil Meadows Bing Crosby Merchant Service replica with a smooth straight thin shank, aluminum band and black ebonite stem. FVF in the 4♧ Becker Dublin. First smoke of the month is a bowl of McConnell Scotish Cake in a MM CG. Sitting in the smoking lounge with a bottle of water to drink. Not far from finishing this bowl of Watch City Flake #558 in a smooth straight early ‘60s Lane era “William Conrad” Charatan Executive Extra Large stretch apple with diagonal channel cuts on the lower right and left of the bowl along with a black vulcanite double comfort stem. Ice tea and bergs is my drink. MB Acadian Perique in a Peterson 150. Still on the same bottle of water. Just finishing this bowl of Edward G. Robinson's Pipe Blend in a 2014 Basil Meadows smooth slight bend squashed tomato with an aluminum band and a black pearl acrylic stem. Now smoking Dan Tobacco Tordenskjold Virginia Slices in a slight bend 1970's Caminetto 102 Business KS billiard with a fumed rim with a pearl gold acrylic stem. Watching On Her Majesty's Secret Service. Just past the half way point of smoking D&R Three Sails in a 1980s straight smooth Big Ben pot with a nickel band and a black vulcanite stem. Now smoking 1970s Heine's Blend in a 1977 straight black rusticated Sir Brent billiard with a silver band repair and a brown pearl grey acrylic stem. Ice water and bergs is my evening drink. Almost time for baseball. Capstan Yellow in a cutty. Now smoking HU White Dog in a 1975 medium bend sandblasted looking, smooth on the sides yellow Pioneer meer with a black vulcanite stem. Watching the Pirates-Reds game. PS LTF in my Bjarne handmade calabash. Smoking a new working blend. I like this one quite a bit, but it's not quite there. In some kind of Savinelli. 3P in a Blatter straight apple. Relaxing after a wonderful pot roast dinner with a bowl of Paul Olsen Dark Flake MOB in a 1982 smooth straight Dunhill Root Briar 31051 Dublin with a black vulcanite stem. Speakeasy in a Savinelli 920. University Flake in a bent Savinelli Dublin. Black Frigate/3P mixture in a Larrysson Dublin. 3rd bowl of Super Value English Mixture today. Trying to decipher this one. haha I swear it is an aromatic and they use liquid smoke as a topping. Anyway, it's really great for the price. This blend certainly wins 1st place in the 'Broke-Smoke' championships. Now smoking McCranie’s Red Ribbon, vintage 2000 in a smooth straight WW2 Pre-Republic Peterson Sterling Canadian with a sterling silver band and a black vulcanite p-lip stem. Watched the Red Sox beat the Indians in a strange game in the bottom of the ninth. Butera Golden Cake in a Mark Stout. Now smoking Watch City Deluxe Crumb Cut in a 2016 PSF POY quarter bend black sandblasted Vermont Freehand egg with an aluminum band and a tortoise shell colored acrylic saddle stem. Watching Gold Finger. C&D's Constellation in a bent billiard AKB meer. Just finished smoking D&R Windsail Platinum in a 1982 smooth straight Sasieni Ivory 105 Apple with a black vulcanite stem. Now smoking D&R Rowland Silver in a smooth three quarter bend 1979 Ben Wade Golden Matt freehand sitter with a brown pearl acrylic stem. Watching Licence to Kill. Now smoking P&W #515 in a 1998 smooth straight Butz-Choquin Bistro 1501 pot with a black vulcanite stem. Likely my last smoke of the day: D&R VIP in a 2004 smooth long shank Canadian Trever Talbot Ligne Bretagne Faite en Bretagne 4/3 with a black vulcanite stem. Watching Gunsmoke. Almost finished smoking G&H American Coffee Caramel in a 2013 bent MM Missouri Pride Legend with a yellow stem. Been reading baseball box scores. A third of the way through this bowl of Stonehaven in a 1998 smooth medium bend Peterson Limerick 69 with a nickel band and a black vulcanite p-lip stem. Have enough left for part or half a bowl. A bottle of Cheerwine is my drink. Watching Mad Dog Russo. Elizabethan in a **Ferndown Bark Billiard. Ice water on the side. Part way through this bowl of Peter Stokkebye Bright Virginia in the first pipe Trever Talbot made when he went to France many years ago. It's a smooth straight Algerian briar Billiard bowl with a long Canadian stem, unbranded. Now smoking Edward G. Robinson's Pipe Blend in a 1982 black sandblasted paneled slight bend Savinelli flat bottom sitter with a black vulcanite stem. Cleaning a few pipes and happy about having a break from the heat. Smoking MacBaren Virginia Flake in a late '90s half smooth/half etched freehand sitter, medium bend Nielsen Viggo with a pearl brown acrylic stem as I watch the Yankees-Tigers game. Just finished smoking Jim's Va/Bur in a 2015 Basil Meadows Bing Crosby Merchant Service replica with a smooth straight thin shank, aluminum band and black ebonite stem. Ice water and bergs is my evening drink. Watching the Twins-Padres game. Now smoking C&D Red Carpet in a medium bend 1983 Ascorti New Dear KS with a black acrylic stem. C&D Vieux Carre in Bent Ukrainian Pearwood - No Perique but peppery. Good nic hit. Visions of Madame Delphine Lalaurie chill my soul. Capstan Blue Flake in my Bjarne Viking. Enjoying a light summer rain shower. The kind where the sun is gleaming and somehow there isn't a cloud in the sky. Now smoking D&R Three Sails in a 1980s straight smooth Big Ben pot with a nickel band and a black vulcanite stem. This will get me to dinner time. Relaxing after a wonderful quesadilla dinner and am now smoking the best durn tobacco made today: Strang in a 2003 smooth medium bend straight grain Ardor Venere Extra signed by Dorelio Rovera Dublin and a black acrylic stem. Watching the Pirates-Reds game. Stonehenge in a Jason Zeiner bent Rhodesian. C&D Corn Cob Pipe & Button Nose in Falcon. Both in regular rotation now. Now smoking Sam Gawith Medium Virginia Flake in a straight smooth patent era 1952 Dunhill Bruyere ODA apple 806 B124 with a black vulcanite stem. 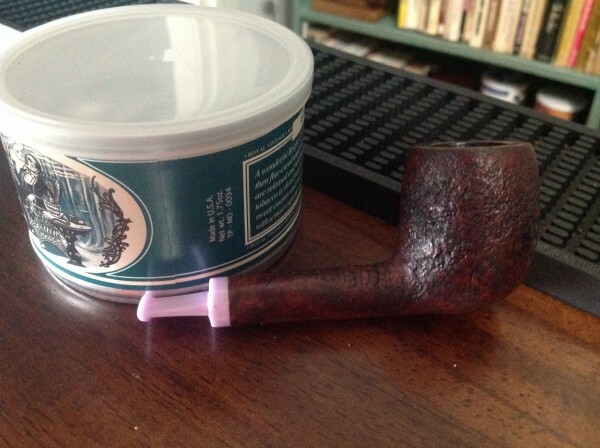 University Flake in a Peterson Standard System bent Apple. A little Chacom apple with a bit of Amphora regular... never had it before, not terrible. Seersucker in a Peterson XL90. Now smoking Watch City Deluxe Crumb Cut in a 2016 PSF POY quarter bend black sandblasted Vermont Freehand egg with an aluminum band and a tortoise shell colored acrylic saddle stem. Phone chatting about pipe tobacco. Now smoking Kramer's Extra Smooth in cutty.